You may be wondering “Will this flu season EVER end?” Just when we get over one bout in our community, it seems as if we have another round. The fact is, we can easily see flu activity well into spring, and some of the more tropical areas—South Florida, for example—may see it all year round. For many, the flu is merely uncomfortable and inconvenient—a reason to miss work, school and activities. But it can be devastating. Some will suffer complications such as bacterial pneumonia or dehydration, which may result in hospitalization. And it can be fatal: several dozen children in the United States have died this season from complications of the disease. While even healthy adults can take the more severe path when they contract influenza—the virus that causes the flu—certain groups are more at risk. Although we often think of the elderly as being at highest risk, young children form another group that’s more likely to suffer complications from the disease. Infants under six months of age are more likely to be hospitalized from flu than any other pediatric age group. Even more likely to suffer complications are babies with other medical problems, such as prematurity or heart disease. Since influenza can be such a problem for babies, how can we protect them? A lot of what we do to reduce the spread of the influenza virus is similar to the steps we take to protect contacts from other viruses, particularly those affecting the respiratory tract. Like many other respiratory viruses, influenza is primarily spread by coughing or sneezing. Thus, covering the nose and mouth during coughing and sneezing bouts can be helpful. Some people avoid contaminating the hands during unexpected moments by sneezing into the crook of the elbow. The flu virus can also live on surfaces and thus can be picked up by direct contact with a contaminated surface. While good respiratory hygiene can help prevent some transmission, frequent wiping down of areas with a disinfectant cleaner is helpful as well. Finally, good handwashing is incredibly important in preventing the spread of disease, especially when caring for an infant! 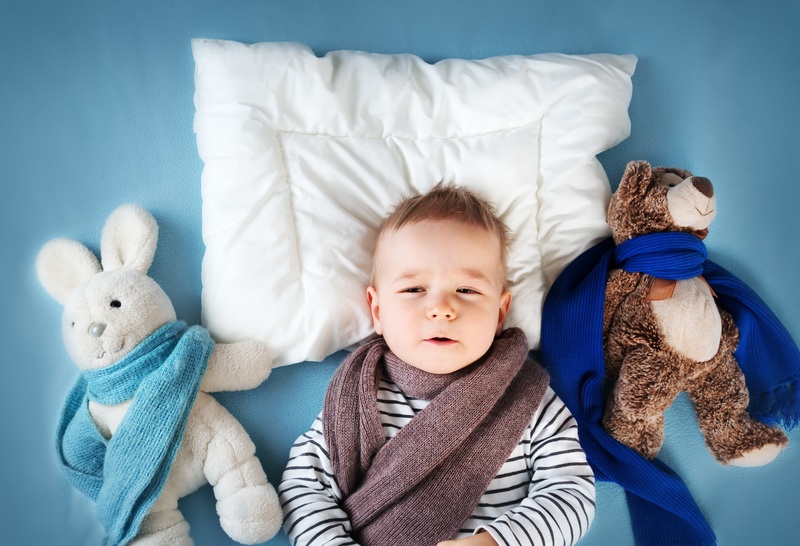 However, one of the most important infection control measures is for high risk individuals—again, that includes young infants—to avoid contact with anyone who might have the flu virus. Thus, politely ask those with respiratory symptoms not to visit! Most viruses, influenza included, last only a few days, so there’ll be plenty of time to call on your new arrival. And during a flu epidemic it’s probably a good idea to limit visitors altogether—especially those such as school-age children who are likely to be exposed. Despite the best of efforts, general infection control measures don’t always work. Over and over, it’s been shown the single most effective step people can take to prevent the spread of flu is vaccination! For many years now, an annual flu shot has been recommended for all age groups. Yet a substantial percentage of people don’t take advantage of this disease-preventing activity. One of the most common misconceptions that keep people from getting vaccinated is the thought that the shot causes the flu. The vaccine, in fact, does not contain live virus. Only living organisms can cause disease. The “flu” that many people seem to get around the time of vaccination may in fact be one of the other viruses going around in the community. This makes sense, since the flu shot tends to be given in the fall and winter, the most active time for many respiratory viruses. One of the other major concern many people have is the presence of additives in the vaccine, particularly mercury. While one version of the influenza vaccine does contain a small amount of thimerisol (a mercury-containing compound), no studies have shown an adverse effect from the amount of this additive. However, if this is a concern to you, there are thimerisol-free version of the flu vaccine; ask your provider. Over and over again, the influenza vaccine has been shown to be safe in the great majority of individuals—so safe, in fact, that it can be given during pregnancy. While it is true that its effectiveness varies from year to year, it always plays a vital role in reducing the number of people that become sick with the flu and reducing complications of the disease. OK, then, you’ve done your part and gotten immunized while pregnant. The other members of your family have received their flu shots as well. You deliver a healthy newborn just as the leaves are turning, and then, BLAM! Right after New Year’s Day, your five-year-old begins to complain of not feeling well. One thing leads to another, and she’s diagnosed with influenza. What now? Although not a substitute for immunization, there are fortunately some medication options. lu). Used properly, antiviral medications are safe—side effects from the most commonly used medication include mild nausea and rash—and can reduce the number of sick days. They also play a role in reducing complications from the influenza virus and well as stemming its transmission. In addition, exposed individuals, including infants three months and above, can take a preventive dose, which may reduce the risk of contracting the disease. If you’ve ever had the flu, you know how uncomfortable it can be. You want to spare your little one from that discomfort and, certainly, reduce the risk of bad disease. The good news is that we are getting to know more and more about the steps we can take to safely keep the influenza virus at bay. Dr. Stan Sack has 29 years’ experience as a primary care pediatrician in Massachusetts and Florida. A medical writer since 2015, he enjoys blogging on topics that are on parents’ minds but are covered less often in books and on websites. He lives in the Florida Keys with his family and enjoys healthy cooking, fitness activities and singing in his spare time. Picking a Pediatrician—How Early Is Not Early Enough? Does a Baby Have Kneecaps? Yes, No, and Sort Of.